This recipe makes me think of my grandmother, MeMe. Any recipe that reminds me of her is one I'll surely be making for a very long time. When I make it, I'm sure to set aside a little extra just for her because I know she likes them so much. 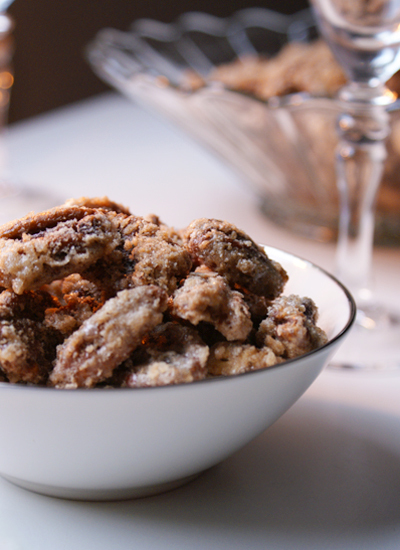 I know what you're probably thinking...pecans are pricey, no doubt about it. However, these particular pecans are sweet, salty, crunchy bits of heaven that make the money you spent on the them an afterthought. They're suitable for any occasion (a Thanksgiving staple in our house), great as gifts (think clear plastic bags tied closed with a pretty little ribbons), and are perfect for topping a light spinach salad or a bowl of ice cream. Your house will smell so good as they bake that you won't be able to resist nibbling on them as soon as you take them out of the oven. Just don't eat them all right away, because as they cool they get crunchier and and even tastier. As they old saying goes, "I bet you can't eat just one!" I know I can't. Preheat your oven to 200° F.
In a large bowl, beat the egg whites and vanilla extract until frothy. Add the pecans and toss to coat. In a separate bowl, combine the sugar, salt and cinnamon. 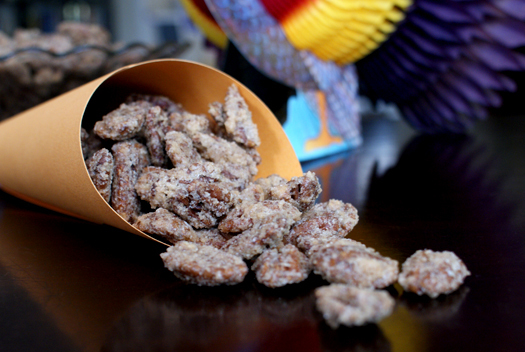 Add the sugar mixture to the pecans and toss to coat. Spread the pecans in a single layer on a greased cookie sheet. I use Reynold's Release aluminum foil without greasing and the clean up is super easy. Bake for one hour, stirring the pecans every 15 minutes. Source: Adapted from a recipe found on Allrecipes.